You can access and play music from your digital music player over the vehicle’s speaker system using the system’s media menu or voice commands. You can also sort and play your music by specific categories, such as artists, albums, etc. 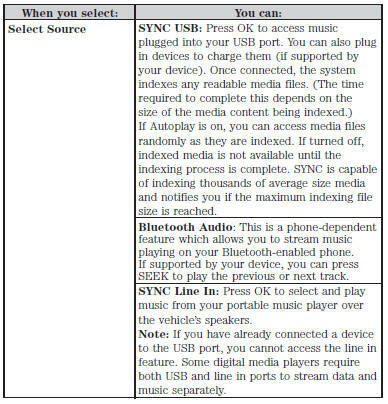 SYNC is capable of hosting nearly any digital media player including: iPod, Zune™, Plays from device players, and most USB drives. 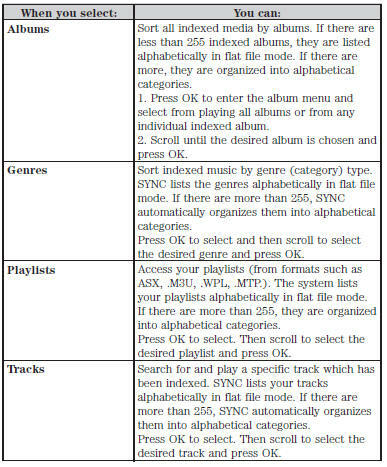 SYNC also supports audio formats such as MP3, WMA, WAV and ACC. Note: If your digital media player has a power switch, ensure that the device is turned on. To connect using voice commands: 1. Plug the device into the vehicle’s USB port. 2. Press the voice icon and when prompted, say “USB”. 3. You can now play music by saying any of the appropriate voice commands. See the media voice commands. To connect using the system menu: 1. Plug the device into the vehicle’s USB port. 2. Press AUX and then MENU to enter the Media Menu. 3. Scroll until Select Source appears and press OK.
4. Scroll to select USB and press OK.
5. 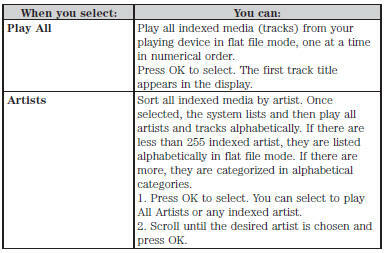 Depending on how many digital media files are on your connected device, Indexing may appear in the radio display. When indexing is complete, the screen returns to the Play Menu. When the desired selection appears in the display, press OK to build your desired music selection. playing, you can press the voice icon and ask the system, “What’s playing?”. 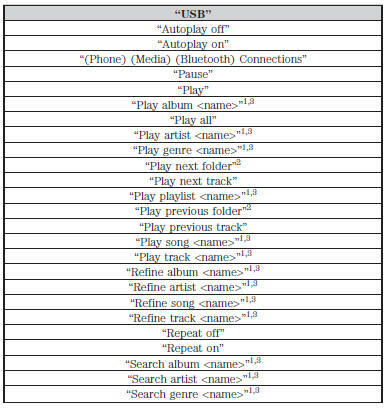 The system reads the metadata tags (if populated) of the playing track to you. 1“<name>” is a dynamic listing, meaning that it could be the name of any desired group, artist, etc. 2Voice commands which are only available in folder mode. 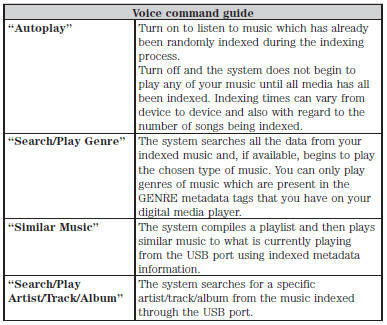 3Voice commands which are not available until indexing is complete. The media menu allows you to select your media source, how to play your music (by artist, genre, shuffle, repeat, etc. ), and also to add, connect or delete devices. 1. Press AUX and then MENU to enter the Media Menu. 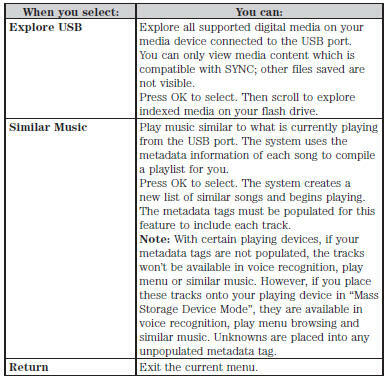 This menu allows you to select and play your media by artist, album, genre, playlist, track, similar music or even to explore what is on your USB device. 1. Make sure that your device is plugged into the USB port and is turned on. 3. 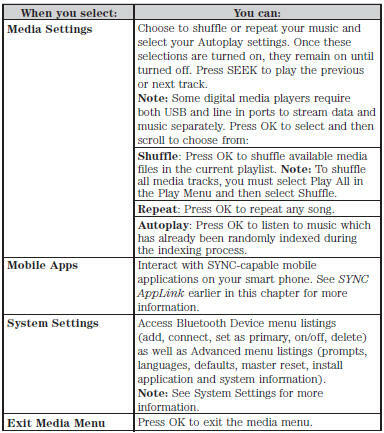 Scroll to select the Play Menu and press OK.
System settings provide access to your Bluetooth Devices and Advanced menu features. 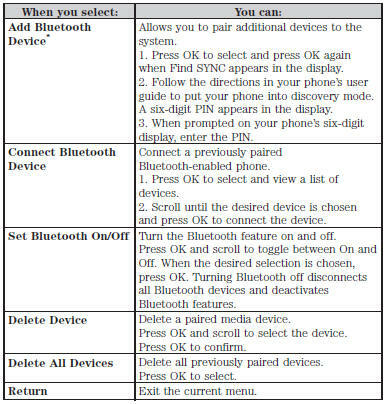 The Bluetooth Devices menu allows you to add, connect and delete a device as turn the Bluetooth feature on and off. Your Advanced menu allows you to access and set prompts, languages, defaults and perform a master reset. This menu allows you to add, connect and delete devices as well as turn Bluetooth on and off. 2. Scroll until System Settings appears and select OK.
3. Scroll until Bluetooth Devices appears. 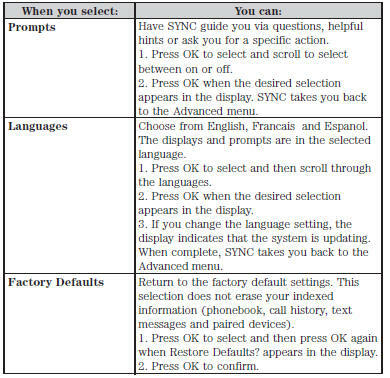 This menu allows you to access settings such as prompts, language, performing a master reset as well as returning to factory defaults. 1. Press AUX and then MENU to access the Media Menu. 3. Scroll until Advanced appears.